Spring is here and it’s that time of year we are deep cleaning and take a good review at our business and how we can enhance its services. Every shop is different with varied needs. Whether you’re a small or large shop it is important to know what equipment will save you time and money, as well as when it’s time to invest in your shop to gain better ROI as long term goals. Integrating a new plan and training your technicians is a proven fact that it will help eliminate constraints in production allowing for more efficient repairs I less time. If you’re looking to update or integrate new alignment systems, wheel balancers, tire changers, brake lathes, inspection systems equipment Chesapeake Automotive Equipment can help you find the perfect fit for your shop and assist in training your certified team. The Auto34S Tire Changer combines simple operation and unmatched capability to easily and safely change the world’s toughest tires and wheels. The Auto34S is the most advanced leverless tire changer in its class, with a simple three-button control, memory function and diameter control, the Auto34S saves time and takes the strain out of mounting and demounting difficult wheel and tire assemblies. Read more about this product and watch videos. Looking for something simple? This model is a rugged economy balancer. Hunter’s DSP7705 wheel balancer is perfect for the quality-conscious, economically oriented shop with a lower volume of service. Read more about this model. Looking for an efficient wheel balancer model with easy-to-use features? The DSP9200 Wheel balancer with convenient dual dataset arms and digital electronics for accuracy. This model has easy-to-use display panel speeds and balancing. Read more about this model. Looking for that heavy duty wheel balancer? ForceMatch® HD is a heavy-duty bus and truck wheel balancer featuring fully diagnostic capabilities designed to solve vibration issues. Read more about this model and watch videos. There are other wheel balancers Chesapeake Automotive Equipment offers such as the Road Force® Elite Diagnostic Wheel Balancer and the Hunter’s SmartWeight® Touch Wheel Balancer the fastest floor-to-floor wheel balancer of its kind. Checkout other models and the entire line here. The BL505 combination brake lathe brings speed, precision and versatility to the brake shop. The unique design of this combination lathe allows the operator to change the setup of the brake lathe from rotors to drums and vice versa with unprecedented speed and ease. The BL505 brake lathe handles rotors up to 23 inches and drums up to 24 inches in diameter, giving the BL505 combination lathe the ability to service a wide range of vehicle applications. Read more about this product. The Hunter AutoComp Elite® On-Car Brake Lathe system keeps your brake service a cut above the rest. The AutoComp Elite® Brake Lathe system was the first to introduce Hunter’s revolutionary Anti-Chatter Technology to provide a smoother surface finish. The AutoComp Elite® Brake Lathe virtually eliminates the buildup of vibration (chatter) that can occur when machining rotors at a fixed speed. Read more about this product and watch videos. Keep more profits in house and control turn-around time with alignments for collision repair! Read more about this product and watch videos. HawkEye Elite® is the most powerful wheel alignment equipment on the market today, using four precision cameras to measure the position and orientation of targets mounted to each wheel using Hunter’s patented QuickGrip® adaptors. Read more and watch videos. 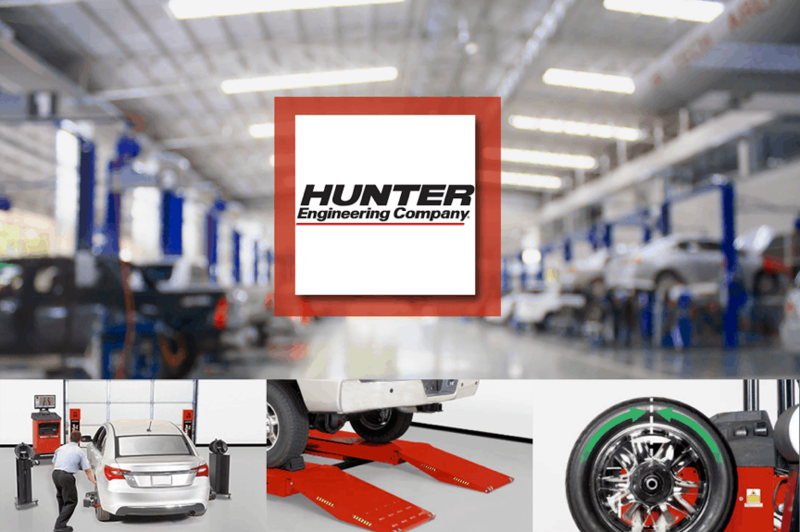 With the Hawkeye Alignment System: two minutes is all it takes to get a printout with alignment reading prepared for your customer, using Hunter’s new PowerBay Express Alignment System. By integrating strategic high-speed technologies, the PowerBay System redefines the wheel alignment service bay for greater speed and efficiency. Read more about this product and watch videos. Read about other Hunter Engineering alignment equipment and products here including ProAlign Alignment System and Hunternet®, a system that Increases your shop’s productivity and revenue with Hunter’s online business intelligence technology and empowers your shop to present digital results, generate powerful management reports, and much, much more. And we cannot forget Hunter’s CodeLink® tool, which can reset steering angle sensors without expensive scan tools and is the new last step in alignment services. Chesapeake Automotive Equipment offers several Hunter Engineering lifts including scissor lifts, four post lifts, and pit racks. Here are a few to mention. RX16 Scissor wheel alignment lifts allow for maximum capacity in a small footprint. Complementing the design on this innovative alignment scissor lift are extra-wide runways, best in-class drive on height, class leading raised height and two swing air jacks. Read more about this model and watch videos. Read more about this product and watch videos. For more lift models including the RX10, RX12 and RX14 visit our page here. Hunter’s Quick® Check is your one-stop vehicle inspection system. These fast, easy-to-use inspection systems can complete a full, comprehensive vehicle inspection in under two minutes. The Quick Check® system gathers valuable information about a vehicle’s alignment, brake performance, battery health, diagnostic codes, tire health and more, allowing shops to check every car, opening the door to new revenue opportunities while improving customer retention. Read more about this model and watch videos. Check out other inspection equipment Chesapeake Automotive Equipment offers, such as Quick IDTM which accelerates the vehicle inspection and automatically identifies the vehicle in motion and QuickTreadTM, Hunter’s drive over digital tire tread depth measuring tool and award-winning WinAlign® software. Guided by an owner with 44 years of industry experience, Chesapeake Automotive Equipment LLC sells Hunter Engineering alignment systems, wheel balancers, tire changers, brake lathes and inspection systems; Pro Spot welding equipment; Challenger lifts; Champion air compressors; USI spray booths; Yellow Jacket AC equipment and more. we offer equipment services, as well as support and training, ensuring your shop’s technicians have the latest in product knowledge and its functionality. Give our expert sales team a call at 800.604.9653 to help you with all your auto body equipment solutions.